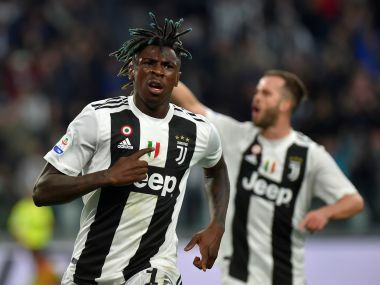 Turin: Juventus became the first team to win Serie A six times in a row when they beat Crotone 3-0 on Sunday to clinch the title with one game to spare. 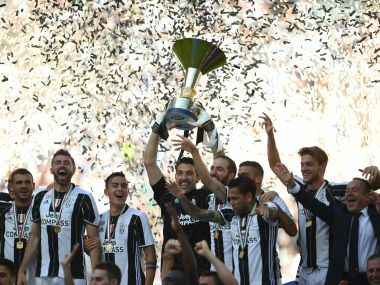 Mario Mandzukic, Paulo Dybala, with a stunning free kick, and Alex Sandro shared the goals as the Turin side also won a league and cup double for the third time in a row and stayed on course for a treble. Atalanta clinched fifth place and a spot in the Europa League group stage by winning 1-0 at Empoli and AC Milan made sure of sixth place, and a place in the Europa League qualifiers, by beating Bologna 3-0. Meanwhile, the apparently innocuous midtable clash between Udinese and Sampdoria produced three red cards and a brawl sparked by a goal celebration. Juve's win over their relegation-threatened opponents, took them on to 88 points from 37 games, four clear of AS Roma who won 5-3 at Chievo on Saturday. Napoli are a further point behind in third, the Champions League playoff spot. 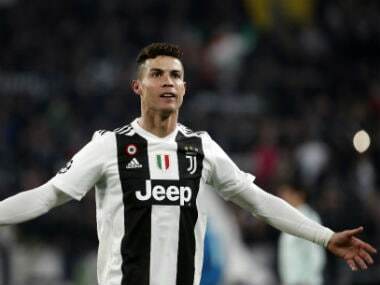 Juventus, who are Italy's most successful side in domestic terms with 33 league titles, will face Real Madrid in the Champions League final on June 3 when they will attempt to complete the treble. “The sixth consecutive title is something extremely significant,” said Juve's 39-year-old goalkeeper Gianluigi Buffon, who has won eight Serie A titles at the club.“We have written indelible pages in the history of football." Buffon was one of six players who have taken part in the last six campaigns alongside defenders Giorgio Chiellini, Leonardo Bonucci and Andrea Barzagli, right back Stephan Lichtsteiner and midfielder Claudio Marchisio. "I have still got a lot to improve on, I don't want to think that this will be the peak of my career," said coach Massimiliano Allegri, who has been in charge for the last three campaigns since replacing Antonio Conte. "If you do not have motivation, you are unlikely to achieve your objectives." Crotone had won five and drawn two of their last seven games as they made a late bid to escape the drop but were facing a Juventus side who have dropped only two points at home all season. The visitors were able to resist for only 12 minutes until Mandzukic got in front of his marker to turn in Juan Cuadrado's low cross at the far post. 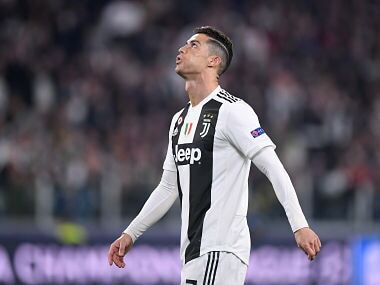 Dybala curled in a stunning 25-metre free kick six minutes before halftime and Alex Sandro completed the scoring in the 83rd minute with a header which hit the underside of the crossbar, bounced down and crossed the goal line by centimetres. Crotone are 18th in the 20-team table but remained only one point behind Empoli, the team immediately above the drop zone. Alejandro Gomez gave Atalanta an early lead at Empoli who were unable to find an equaliser and were foiled by an amazing double clearance off the line by Andrea Masiello just before the hour. Milan had to wait until the last half hour for their goals against Bologna. Gerard Deulofeu volleyed in from Matias Fernandez's pass, Keisuke Honda curled in a free kick and Gianluca Lapadula completed the scoring in stoppage time. Genoa, who have had a dreadful second half of the season, made sure of survival when they beat Torino 2-1 with goals from Luca Rigoni and Giovanni Simeone, the son of Atletico Madrid coach Diego. Sampdoria forward Luis Muriel converted a second-half penalty to earn a 1-1 draw at Udinese but his aggressive celebrations against his former club, where he invited the home fans to jeer him, angered his opponents. Udinese's Danilo grabbed the Colombian around the neck, leading to a brawl which ended with both players sent off. The hosts were reduced to nine as Rodrigo De Paul had already been dismissed for a late tackle.